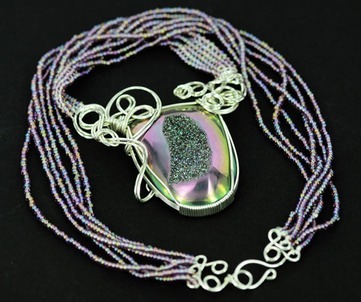 Wire wrapped jewelry may look delicate but it does not really require any more care than other fine jewelry - only than that dictated by common sense and sensible handling. Should you apply pressure and try hard enough, you can bend the wires but this doesn't occur under the duress of everyday wear. Basically you want to keep wire jewellery away from things that will snag and pull hard on the wires. For the most part, this simply means storing them in their box or pouch where they will not become tangled in the hooks or chains of other pieces of jewellery. Be careful when wearing with open weave clothing like scarves and sweaters - if they become entangled gently ease them apart. Frequent cleaning is recommended to maintain the true beauty of your piece. Salt water, chlorine in swimming pools, soap and perspiration take their toll on all fine jewellery - wipe your jewellery carefully with a soft cloth after wearing to keep it clean and free of these elements which oxidise . To help slow tarnishing of sterling silver pieces, dry and seal in a ziplock bag before putting away for longer periods of time. Cleaning wire wrapped jewellery takes a little more time due to the ornate nature of the wire work but it is a simple enough procedure. Don’t use chemical jewelry cleaners as they may ruin certain gemstones or remove special finishes on the metal. Simply use mild dish soap in warm water and a soft toothbrush to gently buff away surface tarnish and remove built up dirt and grime from all the nooks and crannies in the wire work. Try to avoid letting the brush come in contact with the stone - hard stones such as jaspers and agates will be fine but softer stones such as opals, ammonite, ammolite and pearls can be damaged by the bristles. Let dry completely. Polish with a jewellery polishing cloth to remove remaining tarnish and restore bright shine.